The purpose of this trip to Honea Path was explorative. 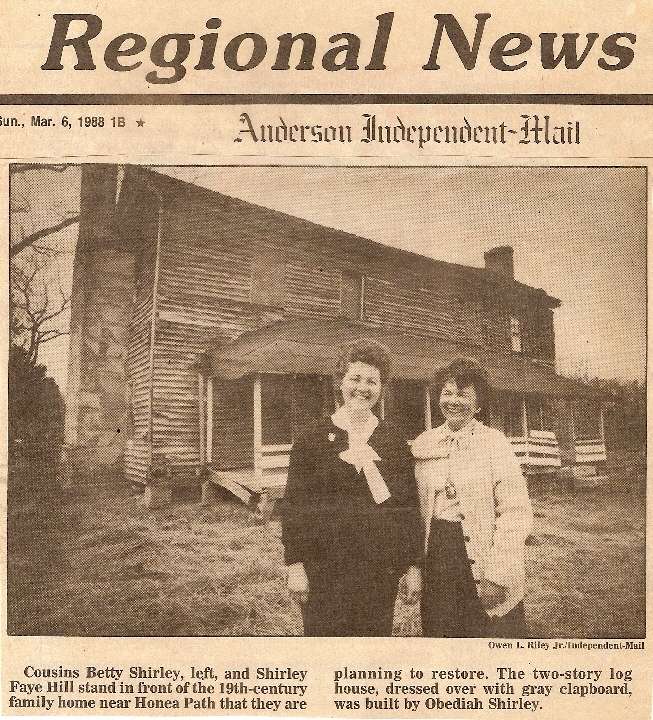 The old Obediah Shirley house (branch #5) had been donated to the Shirley Association for restoration. We need material, volunteers and donations to make this happen when we come back in May 1988. Work week will be May 28th - June 3rd. Shirley Faye Hill and I enjoyed meeting the people who came to the March 6th meeting at the First Baptist Church in Honea Path South Carolina. About 85 people attended. Some came several hours journey to be there. My thanks to you who came. 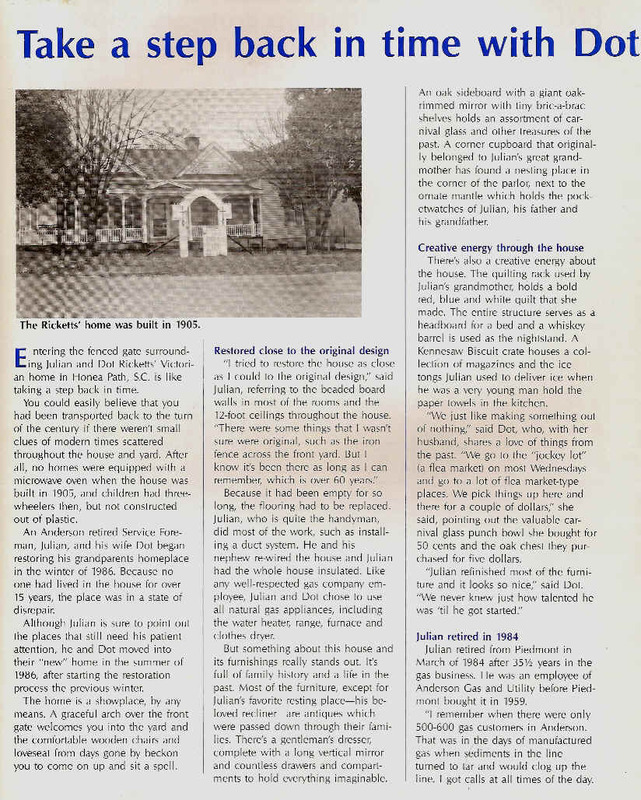 I was sorry Jim Austin who was the person donating the Obediah Shirley house and property could not be there. He was on vacation in Australia at the time. Our hostess, Lydie Thomas, took ill a couple of days before we came to Honea Path and Caroline Scott found us another home to stay while we were there. Our new host and hostess was Dot and Julian Ricketts. Julian is a Shirley and descends from John and Elizabeth Barmore Shirley, branch #2. Our thanks to them for opening their home and taking good care of us. Dot is a great cook! The Obediah Shirley House Foundation, INC. has been issued a certificate of incorporation by the state of South Carolina. The petition for tax exemption is now pending. Because of the tax exempt needs I chose to form a Foundation separate from the Shirley Association. You may wonder how the Shirley Association will continue to be involved in this project since I have set it up as a separate organization. As long as I, Betty Shirley, remain the Foundations president, I will consider the two groups as the same. The Foundation is merely a formality to meet the requirements by the donors of the property who want a tax write off. 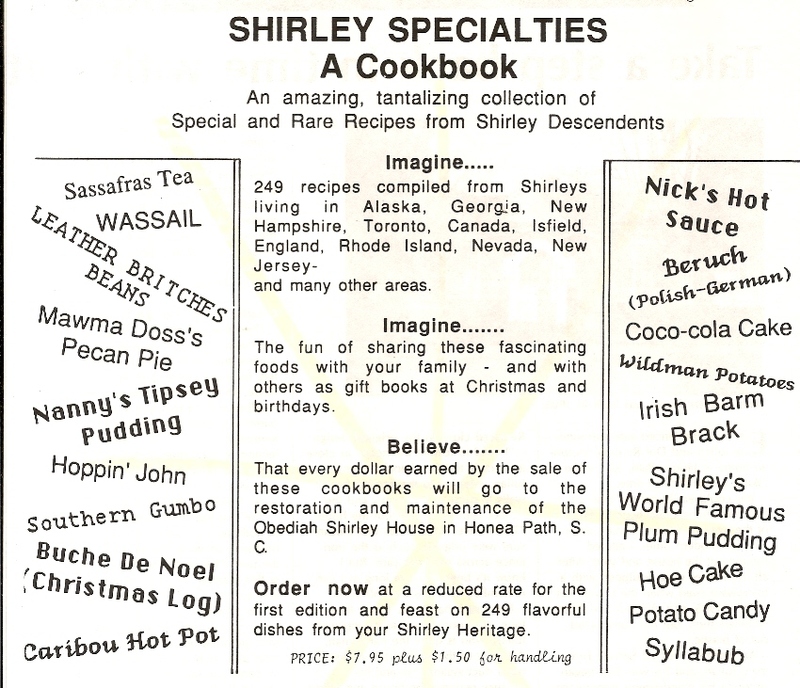 As a fund raiser, we put together a Shirley Cookbook. Dot is a barrel of laughs. 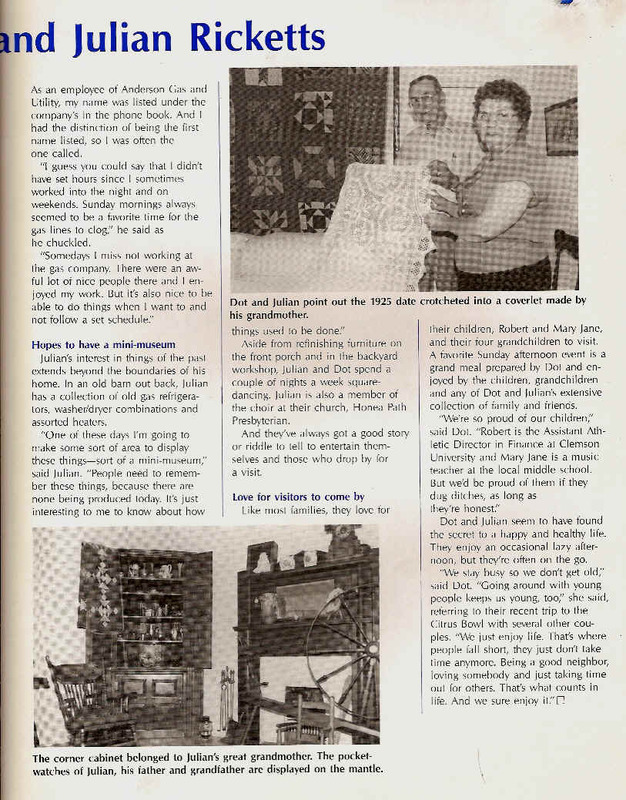 Thought you might like to know more about them.